Ozeki Bulk Messenger as fantastic tool for sending bulk SMS, E-mail or making Voice calls. You will love it, because it will makes you very efficient in completing these tasks. From the user's perspective it is a very simple software. You simply import your contacts, compose or record a message and you press send to deliver your message to the list. What makes it unique is that you can organize, manage and most importantly keep your contact lists up to date. You can combine, add or subtract contact lists and edit them individually to tailor your list of recipients before you send your message out. 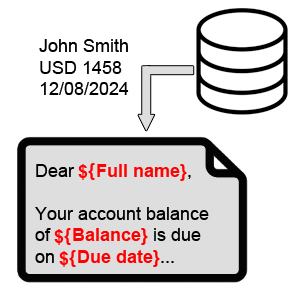 Of course you can include personalized data in the message for example account balance, deivery date or any other information. This information can come from a database, Excel, Active directory, TXT files or any other source. This personalized information can be added to SMS, E-mail or using our built in text to speech engine it can be read in voice calls. Download Ozeki Bulk Messenger Now, and try it for yourself. You will love it. You can download Ozeki Bulk Messenger from the link bellow. Please download it and try it now! If you do not find a featrure you are looking for, please let us know. Our team will do our best to make the product fit for your needs. Our phones are (and always will be) answered by humans, and all the e-mails we receive are read and answered. Ozeki Bulk Messenger supports single SIM and dual SIM Android mobile phones. Setting up G-mail is very easy, but if you wish to use Ozeki Bulk Messenger in a company, you might want to use your company's mail server instead. You can also use E-mail templates to speed up message composition, and to be more efficient.